Buying a new car or truck has become much like buying a commodity, you purchase it at the lowest price possible (regardless of where the dealer is located) and expect the manufacturer Ford, Chevrolet, etc to stand behind their product via their nationwide networks of dealers when it needs warranty work wherever that may be, and they do. This process works for several reasons. The manufacturer is just that—a manufacturer; they manufacture the vehicle, control production for the majority of the components the vehicle, train technicians how to diagnosis and repair the vehicle along with knowing how long it should take to diagnosis and repair each item in their vehicle, allow that amount of time for their dealers to repair it and pay their dealerships retail labor rate to make the repair. The reality is the service department of most car dealerships is more profitable than the sales department in today’s economy. Unfortunately, it doesn’t work this way in the RV industry for several reasons. RV manufacturers aren’t really manufacturers, just assemblers, taking somebody else’s product (door, furnace, sink, rubber roofing, axle, etc) and putting them together to make an RV, much like building a house. Most of the component items carry their own warranty of which the RV manufacturer has no control over. Since RV manufacturers don’t manufacture their own components, it is difficult for a manufacturer to train service technicians on how to properly diagnosis and repair items. And since they can’t control the overall quality of their units, it is hard to calculate what they should hold in reserve to cover the warranty costs per unit manufactured, so they try to control warranty costs by shorting the dealer in the time they allot for repairs, paying less than the dealer’s retail rate or making the dealer contact the manufacturer of the component for reimbursement. Needless to say, warranty work is not profitable for the average RV dealer. To further aggravate the problem, the recent surge in RV sales has left RV dealers scrambling for RV technicians to keep up with the demand for service. While the RV industry has recognized the shortage of technicians and is spending millions hiring teachers, writing curriculum and launching a national training center that will be known as the RV Technical Institute, it will be some time before the shortage of trained and certified technicians fill the void. 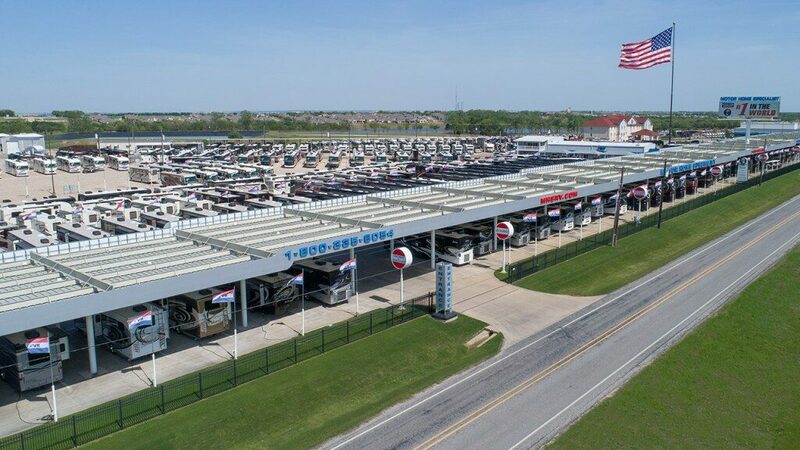 Bottom line: Most RV dealers service departments are currently straining to keep up with the demand for service, with a limited number of trained personnel, while still trying to make a profit, so when the choice comes down to performing warranty work for the customer who bought somewhere else (out of town dealer or online and had it delivered) OR servicing somebody that purchased through their dealership, who do you think receives priority? Being the guy that finds out he can’t get warranty work done by his local dealer is one adventure in RVing I don’t recommend! Maybe the manufactures today should think about building a better product rather than the junk they throw together today, That way they could serve everyone and have fewer service issues. My local dealer was EXCESSIVELY overpriced. I met face to face with the local dealer to attempt to purchase and they basically were being greedy and they did lie to me. I saved thousands and did not buy from my local dealer. It was the best decision! Your suggestion is spot on. But manufacturers need a lot of encouragement to do the right thing since lying to customers is SOO profitable. Saving “thousands” on the upfront price is not the best solution since many thousands of dollars in all-in costs can be buried in shoddy construction. A couple of hundred miles on a forest service road at speed is very helpful in shaking loose inherent design flaws that cost big bucks to put right via upgrade, not just repair. This article makes good sense for the consumer grounded in traditional purchasing methods. But there is a MUCH better way to acquire an RV that does not require being chained to one dealer to fix things that should not have failed in the first place. Once the warranty period is over you’re stuck anyway. In short, buy quality and vet the hell out of the unit before you pay for it. A great way to start is to rent the RV for at least a week and run it hard through all applications you plan to use it for and look for problems. And you’ll find plenty since the manufacturers don’t do anything except throw the product together. Get all the defects fixed (at the dealer’s expense) and then rent for another week of brutal testing. Continue the process until the RV self destructs or actually works. Any dealer who won’t rent is a scam to be avoided. I have not had an issue getting good service locally even though I did not buy it there. And that is why until this Changes, the RV INDUSTRY will look like a Bunch of Redneck Bumpkins. What the Hell Good is to have a RVIA (SEAL) certified stamp on the side of your RV? If it is as meaningless as you report here. You might as well just see the RVIA stamp as a way for the Dealer to Overcharge for you for that 2019 RV. If the Dealers and Industry (Dealers, Suppliers, Manufactures) cannot or will not stand behind, what they collectively (or NOT) build. Then the RVIA Certification, and what it stands for is worthless. When that Stamp appears on the side of your RV, it used to mean, that the people whom assembled the RV, the people whom supplied parts for the RV (LP tanks, Water/Sewer systems, Electric, and Appliances) , and the Dealers that sold the RV’s were joined together as a Team to put out a QUALITY product. And a Buyer could and should expect that all involved used professional skills and standards to deliver the Buyer an exceptional Recreational Vehicle, built with Pride. It that is NO Longer true. You might as well shut it ALL Down. In Elkhart Indiana , Jackson Ohio, or any other place that RV’s are assembled, I would hope that people whom assemble RV’s understand, that their Buyers will NOT stand for overpriced GARBAGE. You want to make some money from assembling an RV? Then make it a High Quality RV. I am willing to pay for a Quality product. But, the RV Industry does it Buyers and itself a disservice, when they turn out Low Price and Lower Quality RV’s. Or, will not MAN UP and stand behind what they collectively produce. Get your STUFF together folks. The Buyers can give a cow pie whom wants to pass a buck, and blame each other for letting the RV owners down. When an RVIA Badge or Seal is on the Side of an RV, BUYERS should Expect the Best, and NOTHING less! If an RVIA Badge or Seal is NOT on the side of an RV, BUYERS should RUN and not just walk away from it. If the folks that Assembled, Built, or whatever an RV, did NOT care enough to get (MEET) the RVIA standard for an RV? Why should you as a Buyer/Owner trust or spend your hard earned cash buying it? I disagree with the article. When I bought my unit, new, it came with a two year warranty from the RV manufacturer. Now the manufacturer has multiple authorized dealers to sell and service their products, I agree with one of the above replies about my local dealer gouging the customer. I bought my rig from a dealer 4 1/2 hours away because they sold me the identical rig for about 40,000 cheaper, not to mention actually having one in stock to look at and not just from a brochure. I required after market warranty work and my local dealer provided the service after being authorized by the manufacturer. RV warranty work is always a fight for who is going to pay for it between the dealer and the manufacturer, regardless of where you buy. It is always in the consumers best interest to shop around. The MSRP is just that, a suggestion. This article is accurate in many ways. For many, one of the most frustrating aspects of ownership is warranty work and service. While there are certainly exceptions, you hear many nightmare stories about dealerships taking months to perform warranty work or denying it all together. In our case, we have always gotten priority attention and service from our selling dealer. On occasion, they gone above and beyond to help us. The exception we have to this article is with Ford. There are 4 Ford dealerships within 15-30 minutes of our home and NONE of them will work on motor homes. They want nothing to do with motor homes. Surprisingly, Ford does not require them to either. I had one dealer tell me that with them selling 300-400 new vehicles per month, they simply don’t have the time or interest in working on motor homes. They don’t want them on their lot and they stopped training/certifying their techs to work on them. When I called Ford to discuss this issue, they acknowledge it’s an issue. They did tell me they’ll approve a third party to perform warranty work but if it’s a power train problem, you must use a Ford dealer. In our case, the closest Ford dealer that will work on a motor home is 65 miles away. So, if I can’t drive the coach for some reason, Ford will pay to have it towed 65 miles??? I hope I don’t have to find out. My local Winnebago dealer won’t work on my Itasca because it is over ten years old. How’s that for support? Glen, sometimes when i’m feeling blue I eat a warm bowl of chili. It’s good for the soul. Here’s more- Many local dealers and independents have no qualified personnel who can accurately diagnose and repair many rv problems. I had 3 different rv places and a mobile outfit mis diagnose my slide problem. La Mesa RV out of Davis, Ca charged us over $2,600.00 and it never worked properly after that. Fast forward through much more frustration and we finally went to the factory in Junction City, Ore. These people are competent and good to deal with. We should have followed our instincts a long time ago and made the drive up there (Winnebago). My advice to you is….if there’s any way you can make the trip, go to the factory if you can’t rely on your local shops! Here’s how I beat the no=quality, lack of customer support, price-gouging issues…I quit RVing. Now we stay in motels and have a free breakfast, newspaper and a swimming pool. Absolutely right! Aside from the few that are four-season and boondock-capable, an RV can only lumber down a paved highway from one overpriced RV slum to another at a huge all-inclusive cost. Much better to luxuriate at a variety of resorts and inns and let the maid do the chores. A very powerful addition to your vehicle is a 2-3 day bivouac-stocked backpack and hiking boots that can get you into nature like no RV park or campsite ever can and for free. Gee Stephen. Why are you even here? Promoting over priced resorts and lodges apparently. No, the original poster provided the reality check of the effete mass trailer market. To the contrary, I recognize that an empowered four season boondockable RV can provide access to millions of square miles of nature’s bounty that never sees an RV park or “campground” and no resort can come close to. Resorts are for people who are tired and will be content with the same view of life. I must be very lucky. We have experienced few issues with our RV’s over 15 years. And, we have never had a problem getting warranty work completed or out of warranty repairs. We have a marvelous mobile tech for when we can not get the RV to him. Maybe some here approach things in a different manner and expect too much, too soon?